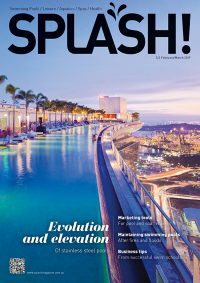 The digital edition of SPLASH! magazine (Issue 104) is out now. Veda Dante looks at the latest options for creating a vibrant poolscape that offers an invitation to the garden while protecting us from the sun. Coffs Harbour was home to the first elevated commercial waterslide in Australia. Now waterslides have made a dramatic return to Australia’s most recognised family attraction. 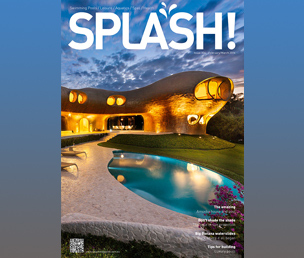 With renowned Mexican architect Javier Senosiain coming to Australia, it is timely to look at one of his most stunning house and pool projects. Cal Stanley gives us the benefit of his experience dealing with wealthy (and often demanding) clients, and offers tips on how to keep them happy. Over his 27 years in the swimming pool and spa industry, John Webb has seen evolutionary development in the pool cover segment. Who’s wearing the CFO’s hat in your business? Sue Hirst talks about the importance of a chief financial officer and describes the many and varied roles they have to carry out. The new swimming pool hall at the PRC Embassy in Canberra brings light and energy into a modern design that fits with the traditional Chinese architecture. Penn State University in the United States takes their athletic achievement seriously, so they couldn’t cope with the swimming pool that was under par. 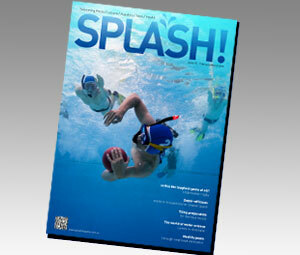 Click here to subscribe to SPLASH!